Home→Blog→Holidays/Events→How Are You Putting Your Best Fork Forward This Month? ← The #4 Truth That You Cannot Ignore! How Are You Putting Your Best Fork Forward This Month? March is National Nutrition Month, when the Academy of Nutrition and Dietetics reminds everyone to return to the basics of healthy eating. It is also the time of year when the Academy celebrates expertise of registered dietitian nutritionists as the food and nutrition experts. 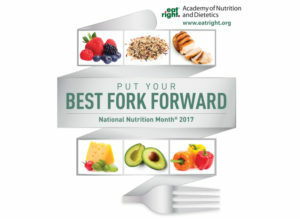 “Put Your Best Fork Forward” is the theme for NNM 2017 which serves as a reminder that each one of us holds the tool to make healthier food choices. Making small changes during National Nutrition Month® and over time, helps improve health now and into the future. What are you doing in your community to celebrate National Nutrition Month? Share your success stories & ideas with us on Facebook!